Welcome to Black London Histories, 1958 – 1981. A packed night at the Coleherne. From Valerie Wilmer, ‘Sunday at the Coleherne’, Flamingo, August 1964. Between the mid 1950s and the early 1960s West Indian and African drinking clubs were founded with increasing rapidity across the city. Most were quickly recognised, by supporters and detractors alike, as important new black or cosmopolitan spaces in the city, significantly changing the character of the urban landscape. In this first blog post, I use my recent research reading West Indian magazines and local newspapers to ask why these clubs arose when and where they did, and why they declined so dramatically by the early 1960s. 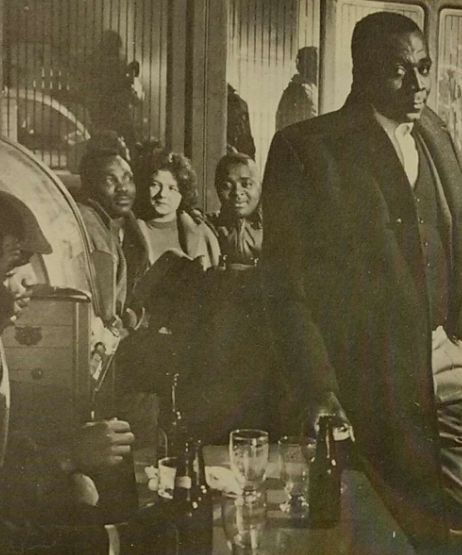 What is the story of the drinking club, and what was its role in the creation of new social and leisure sites and experiences in black London of the 1950s and early 1960s? When Valerie Wilmer, writing for Dominican journalist Edward Scobie’s Flamingo magazine, visited the Coleherne in South Kensington’s Old Brompton Road in 1964, he found the pub to be a beacon of cosmopolitan conviviality. ‘At 12 noon the Coleherne opens its doors and five minutes later you’re lucky to find a seat in the place. Half an hour later, if you can force your way through the jostling crowd of beer-swigging West Indians and Europeans, brother, you’ve got wider shoulders than I have!’. Trinidadian steel drummer Russ Henderson began performing at the Coleherne with his band in 1962. He was soon joined by Joe Harriott and Shake Keane, leading lights of London’s jazz scene. ‘[T]he coloured boys threw open the doors’, wrote Flamingo, ‘and the Coleherne became one of the wildest places in London. … Now every Sunday this pub is a marvellous example of integration on every level’. Not all pubs were as ready to throw open their doors to ‘coloured boys’, however. In South London, where the majority of the city’s West Indian population settled, the ‘colour bar’ was the more common story of pub life. Pubs operating colour bars made regular news in the local press: the Robin Hood and Little John in Deptford hit the headlines for instigating a colour bar in 1958, right on the eve of white riots in Notting Hill. Across the other side of the city, in Battersea, a colour bar was in operation at the Cedars Pub, while down the road in Balham, a bar at the United Ex-Servicemen’s Club saw non-white members of the Club’s cricket team required to stand outside with their drinks after games. In the south east, the Dartmouth Arms in Forest Hill became perhaps the most notorious case, when local fascists pledged their allegiance to the pub’s colour bar, calling a demonstration in support of it. Colour bars were also operating across a range of pubs and clubs in Brixton, where the South London Press reported that ‘Only a few’ pubs ‘encourage the coloured population’. West Indian men were barred, also, from attending local dance clubs in Brixton and Streatham without a partner. These bars were instigated by licensees and usually defended as decisions made on the basis of their (white) customers’ prejudices. The racism here was visceral. As Harry Rawlinson, licensee at Herne Hill’s Milkwood Tavern explained to the South London Press in 1958, customers had told him ‘We won’t drink out of the same glass as those coloured people’. From South London Press, 9 December 1958. This was also, though, a race politics cut through with class. In most cases, colour bars operated through a segregation of the space of the pub. London pubs at this time still regularly operated both a public bar and a saloon bar. The saloon bar had developed since the early nineteenth century as a segregated space within public houses, open to middle-class patrons who wanted to distance themselves from the working-class customers of the public bar. Often, a licensee would maintain the pub’s segregation by selling higher-priced drinks in the saloon, and cheap ale in the public bar. But often, too, licensees would simply refuse service in the saloon bar to those they felt did not meet the presumed higher status of its other patrons. In London pubs, the colour bar most often meant that non-white customers were refused service at the saloon bar, and redirected to the public bar. My investigation revealed something of the astonishing social and class distinctions which lie behind English pub habits; as in other apparently clear-cut colour prejudiced problems, colour is in fact overlapped by class, by social distinctions, by the appearance and dress of the individual. If it was a space of middle class and upper-working-class ‘respectability’, though, the saloon, as South London Press’s columnist ‘Wanderer’ commented in 1964, on the eve of the General Election, could nonetheless be a hotbed of race politics of the ugliest kind. ‘Bring up this topic [of race] in the saloon bar of your local and you soon find controversy raging and sometimes we hear the mean little remark, “If you want a n[***]r as a neighbour, vote Labour”’. Middle-class West Indians led the campaign against the colour bar in public houses, surely in part because they found themselves unable to drink in that part of the pub that they felt their station should allow. These campaigns, which opposed the renewal of licenses on the basis of discrimination, were often successful, and were undertaken against colour bar pubs regularly, until the 1965 Race Relations Act made complaints to the newly formed Race Relations Board a more direct form of opposition. At the Dartmouth Arms, a long and bitter campaign began under Geoffrey Browne, a West Indian company director refused service in the saloon bar in 1964. As the South London Press acknowledged of Browne’s exclusion, ‘If he had been in overalls or uniform he might have been directed to the public bar on the ground that he was not dressed for the saloon bar. But this discrimination was obviously against his colour’. Protesters outside the Dartmouth Arms. From South London Press, 8 December 1964. Browne organised a picket of the pub, and joining him on the picket were more West Indian professionals, including Melbourne Goode, a local businessman and vice-chairman of the Brockley International Friendship Association, and Roy MacFarlane, the chairman of the Association. These men were well-integrated into local civil society, and Browne and the Brockley International Friendship Association quickly recruited the Lewisham Trades Council to their campaign, and were also joined on the picket line by Lewisham Labour Councillors, and the Labour parliamentary candidate for Lewisham, Joan Lester. Such alliances were common, and local West Indians Neville Parkinson and Egris Sinclair had launched a similar campaign against the Milkwood Tavern in 1959, successfully bringing in the support of the Lambeth Trades Council, of which Sinclair was a member, to oppose the renewal of the license. 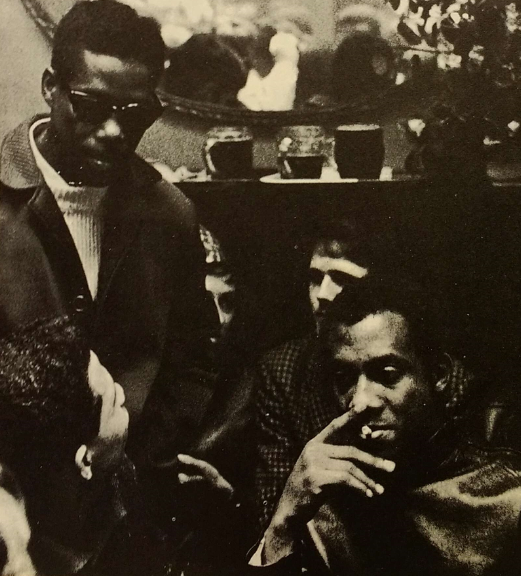 A campaign against the George pub on Effra Parade between 1963 and 1966 also saw a coalition between the Lambeth Trades Council and local inter-racial clubs, including the St John’s Inter-Racial Club and Lambeth Inter-Racial Council. When campaigns against the license renewal for the George failed to end the colour bar, these groups lodged a complaint with the new Race Relations Board, making the colour bar at the George among the first that the Board considered on its formation in 1966. In the case of the Dartmouth Arms, the coalition arraigned against the licensee Henry Hawes made the campaign an instant media sensation through their connections to the press, and their skill at courting the media. While Hawes eventually won the battle, and retained his license, he did so at the expense of widespread public condemnation. 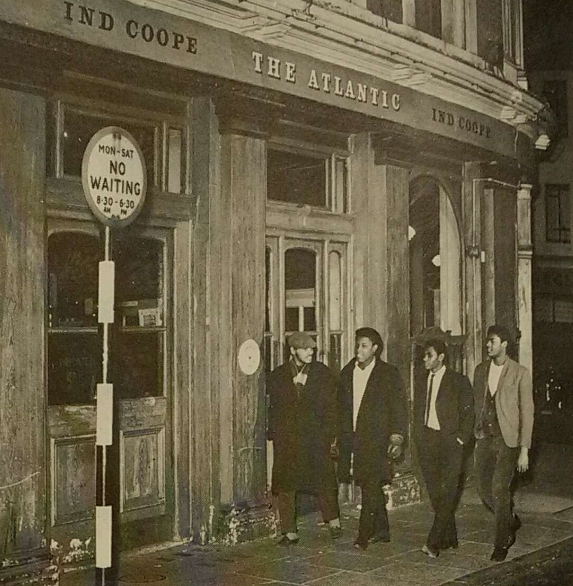 If black Londoners found white licensees refusing them service, however, they might choose instead to visit one of the number of black-staffed pubs springing up in the early 1960s. Brixton’s Atlantic pub was one of the first in Brixton to employ West Indian women as bar staff. The pub was tremendously popular with local West Indians. As Flamingo wrote in February 1964, if Brixton lacked a community centre for West Indians, ‘Well, there’s always the “Atlantic” … Brixton’s favourite pub … the unofficial Community Centre of West Indians in Brixton’. It was also a cosmopolitan space, where mixed-race unions were forged, and new cultures of conviviality thrived, most visibly in August 1965 when Keith Dalton, son of the pub’s English licensee, married a West Indian woman, Miriam Hall. The Atlantic pub, Brixton’s ‘Unofficial Community Centre’. From Eric McAlpine, ‘What’s Wrong with Brixton?’, Flamingo, February 1964. West Indians also became licensees themselves. In June 1965, Jamaican Oliver ‘George’ Berry, a former refrigeration engineer, became London’s first black licensee when he took over the license of the Coach and Horses, which he ran with his English wife, Rose. Three years later, Martin Luther Perkins became London’s second black licensee when he took the license of Peckham’s Swiss Tavern. Perkins, who had worked pubs since his adolescence in Clarendon, Jamaica, trained in London with Berry at the Coach and Horses. Perkins taking the license was a ceremonial occasion, with the first pint pulled going to the Jamaican Assistant High Commissioner, Mr R. Phillips. Opening the pub, Perkins told the South London press that he expected most of his custom to be from local West Indians, though he hoped to emphasise, at a time when social and leisure spaces still often operated along segregated lines, that ‘Whatever their colour, people will always get a welcome here’. The few black licensees making their mark on London by the second half of the 1960s were overshadowed, however, by the far greater numbers who earlier in that decade and the one preceding had opened their basements as private drinking clubs to accommodate their fellow citizens affected by the colour bars of local pubs. Bradford Wilson, a 43-year-old plumber who had emigrated from Jamaica in 1952, and set up the Wickey Wackey Club in Railton Road seven years later, appealed against an attempt to refuse him a license in 1963 by reminding the licensing authorities that ‘there was a large coloured population in Brixton and Jamaicans were not popular in the public houses’. 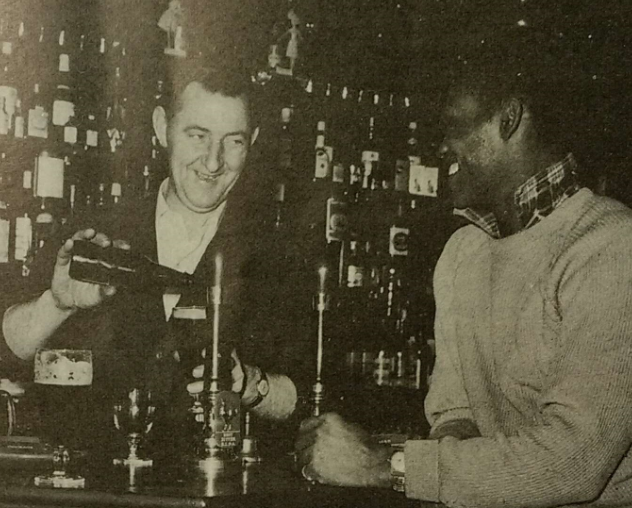 Lester Newell, a former engineer fitter who decided to open such a club in 1961, similarly argued before the Wandsworth Licensing Bench in February of 1963 that ‘Coloured people feel frozen out in English pubs and prefer to drink in their own’. Newell’s Club Sylvano was a typical operation: thirty members, ‘a predominantly coloured club’, run from a converted basement in Clapham. Such clubs dotted the landscape of South and North London. In South London alone between the mid-1950s and the mid-1960s, just north of Newell’s Club Sylvano, in Battersea, were the Blue Gardenia at Battersea Park Road, and De Esperanza on Bennerley Road. To the south was the Goldfish Club in Balham. 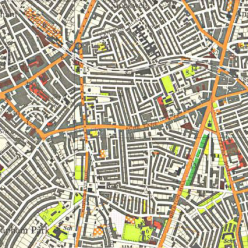 In the east, 31 Loampit Hill ran in Lewisham, while in Camberwell and Peckham were the Carram Club on Northlands Street, the Normandy Club on Peckham Hill Street, and the Sunflower Club on Queen’s Road. Further south in Dulwich was the Eldorado, on Underhill Road. In Brixton the clubs were most numerous. Coldharbour Lane alone hosted Wickey Wackey Club, the Havana Club, the Mango Club, Onie’s Club, and the Afro-Caribbean Café, while Railton Road held the Glass Bucket, the Railton Club, and the Unique Club. On Somerleyton Road was Silver Slipper Club and 41 Club. Elsewhere in Brixton were the Grand Duchess, the Moonlight Club, Club Leslie, Birdland Club, the 74 Club (later the Domino Club), Tropicana Club, Rialto Club, Palm Beach Club, Chicago-After-Midnight, the Effra Club, and another Havana Club, this time on Crawshay Road. As Newell indicated, these clubs served an important social function. When, in 1959, Mr C. Williams was ordered to close the Blue Gardenia, which he had run from the basement of his house on Battersea Park Road, he pleaded to the court that the ‘club provides coloured people in the area with some sort of recreation, particularly at weekends. It is very popular with those who find it hard to find amusement in London’. Making a plea against four other clubs ordered to close in September 1963, a Mr F. H. Samuel explained to the Newington Licensing Planning Sub-Committee that ‘The majority of coloured people in Lambeth are living in extremely overcrowded conditions which make it impossible for them to entertain their friends in their own homes’. While few clubs explicitly advertised themselves as venues for social work and welfare—that role being largely the reserve of inter-racial clubs such as St John’s Inter-Racial Club and Brockley International Friendship Association—they were nonetheless linked up to informal welfare structures. The Mango Club, one of Brixton’s best-known ‘coloured clubs’ of the 1950s, was established by Albert King Harmen Lewis, a West African retired welfare officer, formerly staff at the Colonial Office. Lewis prided himself on having helped several members to ‘solve their domestic problems’, fulfilling, in the words of one member—a civil servant and ex-Royal Navy Reserve Volunteer Lieutenant Commander­—‘a useful social service’. “They will go to their individual homes for dinner, and then either stay home, visit friends, or attend a local pub. If they decide on a party, they dare not ‘twist and shout’ too loudly, for risk of finding themselves at variance with their neighbours and the police” –Flamingo, February 1964. Alongside the clubs (the distinction between the two not always clear-cut) was a thriving house party scene. As journalist Colin McGlashan remembered in a reverie on these old clubs penned in the early 1970s, Somerleyton Road, the heart of West Indian settlement in Brixton, ‘was wide open, a shebeen in every other basement’. These parties ‘gave off a sharp joy, snatched, sometimes, from the edge of despair’, a warmth supplied, as McGlashen wrote, quoting from Edward Kamau Brathwaite’s Rights of Passage, “with our hips and the art of our shuffle shoes”’. Even in the heart of Brixton’s West Indian settlements, though, such parties had to tread carefully if they were not to come in for censure. ‘They will go to their individual homes for dinner, and then either stay home, visit friends, or attend a local pub’, wrote Flamingo in 1964. ‘If they decide on a party, they dare not “twist and shout” too loudly, for risk of finding themselves at variance with their neighbours and the police’. Indeed, as A. B. Thompson, welfare officer for St John’s Inter-Racial Social and Cultural Club told Flamingo, ‘The easiest thing for an English person to do is to telephone the police and tell them that West Indians are making noise next door; the police will be there in a moment in large numbers’. In one such case in Kilburn in August 1964, police used dogs to break up a West Indian party held to celebrate Jamaica’s independence anniversary. West Indian and African clubs, and shebeen parties, faced a multi-pronged, coordinated campaign against them in the early 1960s. In some cases the campaign was based on terror. South London’s Chicago-After-Midnight was subject to multiple arson attacks in early 1959, as was the Wickey Wackey Club. Later that year, Peckham club owner Philip Oli had his car burnt out in a similar attack in early November, and youths stormed and ransacked East Dulwich’s Eldorado Club the week following. In 1963, Onie’s Club in Coldharbour Lane was also subject to an arson attack. More often, though, and ultimately more effectively, campaigns were legal, organised, and worked in tandem with agencies of the local state. ‘To observers of the Brixton scene a few years ago such a happening would never have been foreseen. With the first rush of coloured basement clubs—all opened without permission—came a tide of white complainants. This started a batch of public inquiries, with furious housewives describing incidents outside their homes’. As the newspaper reported, the path leading clubs to hearings before licensing and planning authorities was often via complaints from their neighbours. Neighbours’ petitions prompted, or legitimated, action from the council. De Esperanza on Battersea’s Bennerley Road, in a typical case, faced a petition signed by ‘nearly all the residents’ of the street in 1960. Two years on, South London Press described Lambeth Council having been ‘for years … swamped by letters and petitions from residents near some clubs, urging their closure’. Once inquiries were prompted with the local council, clubs invariably fared badly, struck off for lack of planning permission, or for insanitary or insufficient amenities. Often it was argued that the basements should not be converted into clubs in a time of such severe housing shortage—though as the owner of the Grand Duchess club, ordered to close in 1961, said in reply, the basement rooms could not be used as accommodation because of their damp. Behind most neighbours’ complaints, though, was the suggestion that the clubs brought down the ‘respectability’ of the area, and indeed local residents and local papers alike tirelessly provided an image of these clubs as dens of vice and iniquity, where gambling, prostitution, drugs and violence were commonplace. This operation was also encouraged from above, though. In 1961 the Lambeth Council bought up the freeholds for Somerleyton Road and Geneva Road, where many West Indian drinking clubs operated, in a move designed to close them down by refusing to renew the licenses for the clubs. Minister for Housing, Henry Brooke, publicly lent his support for this strategy. The following year, new powers under the Town and Country Planning Act 1962, requiring all clubs to be registered and need planning permission, was further welcomed by Lambeth Council, and put to immediate effect in an order to close Railton Road’s Unique Club. ‘The new Act now means we shall have more control over the clubs, many of which have become dens of vice’, a spokesperson for the council announced. ‘We shall do all we can to stamp out undesirable clubs and oppose those which have not received planning permission’. In tandem with this action by the council, George Bentley, chief of police in Brixton, promised that ‘Clubs which continue to run after being refused a license will be raided on a warrant, every night if necessary, to let the people running them see they cannot flout the law’. Since September 1961, Bentley had led a campaign dubbed ‘Operation Shut Down’, for which he credited the closure of twenty-five clubs, and fines against the owners. Bentley’s tactics of covert surveillance, under-cover policing, and raids, saw many clubs lose their licenses on charges of selling drinks after licensed hours, and selling alcohol without a license. In the face of this calculated attack, few West Indian and African clubs active in the 1950s and early 1960s survived into the latter part of that decade. V. A. Safl, a West Indian journalist reporting for the Brixton Advertiser in the spring of 1962, found a many local West Indians melancholic for the loss of their once-vibrant club scene, and cautious to even talk about the whereabouts of any remaining sites of refuge. My inquiries carried me to some Pubs and some of the few remaining Club Houses left open in Brixton. Most of the Club Houses have been closed since the authorities, due to one reason or the other refuse to renew the licenses. At present to ask any one “dark” about the whereabouts of a particular club is perhaps an attempt to court a rebuff. The most common answer is “I don’t no man”, in a tone to depict the voice of a mother mourning the death of a dear baby. I ask more than eight people at different points and times and none seemed to know of any club left opened. Where and why did the clubs go? London’s basement clubs did not completely disappear by 1962, but they were certainly thin on the ground. If the genesis of these clubs was in part the exclusion of non-white Londoners from many of the traditional leisure spaces of the city, their decline might be read as the counterpart to the gradual opening up of such spaces as black publicans set up shop in London neighbourhoods, and as the Race Relations Act provided black Londoners with an institutional framework through which to challenge their exclusion. But this was not the case. Rather than a shift from one type of leisure space to another, as pubs became more tenable as sites of sociability, the closure of the clubs was part of a campaign initiated by local residents in tandem with the local council, the police, and often the local newspapers, who regularly ran exposes on these clubs. The club closures pre-dated the introduction of the Race Relations Act, and indeed even with the passing of that act, several pubs, notably the George and the Dartmouth Arms, simply ignored it and continued to operate the colour bar they had long ago implemented. Jazz at the Coleherne. From Flamingo, August 1964. The story of the closure of London’s basement clubs, then, needs to be read instead as the history of local conflicts over racialized spaces, in which white Londoners sought to drive out racial difference from ‘their’ streets and from ‘their’ pubs, and in which black Londoners, through campaigns against the colour bar and through the establishment of independent drinking clubs, provided a resistance against this affront, sometimes organised, sometimes ad hoc. In doing so, they carved out precarious spaces for themselves in the city, which would come to serve important symbolic functions in the development of racialized topographies of the city, both for those detractors who lamented the transformation of London’s streets, and, for a later generation, as celebrated early instances of black resistance and the creolization of the metropolis. Valerie Wilmer, ‘Sunday at the Coleherne’, Flamingo, August 1964, pp. 23-25. ‘Pub Colour Bar to be Questioned’, South London Press, 25 July 1958, p. 1. ‘No Colour Allowed in this Bar’, South London Press, 20 December 1963, p. 1; ‘Member Quits over Colour Bar in Club for Ex-Servicemen’, South London Press, 30 July 1963, p. 3. ‘Mosleyites Support Colour Bar in the “Dartmouth Arms”’, South London Press, 12 December 1965, p. 1. ‘Of Course I Operate a Colour Bar, Say a Licensee’, South London Press, 9 December 1958, p. 7. ‘Dance Club Owner Bans Coloured People—“Just a Matter of Business’, South London Press, 10 January 1961, p. 6; ‘Locarno Restricts Coloured Dancers’, South London Press, 8 August 1958, p. 7. See Paul Jennings, The Local: A History of the English Pub (Stroud: Tempus, 2007), pp. 109-110, 216. John Ross, ‘Operation Guinness’, Flamingo, February 1965, pp. 9-11. Wanderer, ‘Colour is a Problem No Political Party Dare Even Mention’, South London Press, 25 August 1964, p. 4. ‘Coloured Men Were Refused Service in Saloon Bar’, South London Press, 15 September 1964, p. 1. 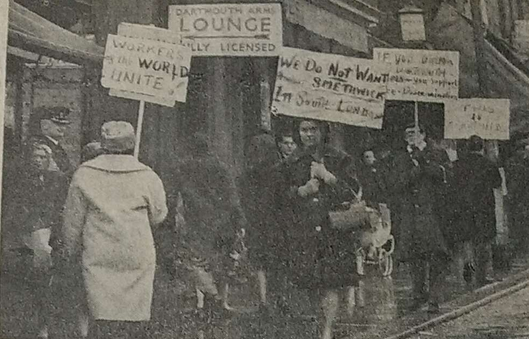 ‘Pickets Soaked in “Dartmouth Arms” Demonstration’, South London Press, 8 December 1964, p. 1. ‘Licensee Ends Colour Bar’, South London Press, 17 February 1959, p. 1. ‘Colour Bar is Alleged at Pub in Brixton’, South London Press, 11 January 1966, p. 1. ‘“Trial” of Colour Bar at a Pub’, South London Press, 22 February 1966, p. 1. Eric McAlpine, ‘What’s Wrong with Brixton?’, Flamingo, February 1964, pp. 13-15; ‘Marries a West Indian’, South London Press, 27 August 1965, p. 1. ‘Coloured Publican Gets His License’, South London Press, 25 June 1965, p. 10. ‘South London Gets its Second West Indian Landlord’, South London Press, 5 April 1968, p. 3. ‘No License for a Coloured Club in Brixton’, South London Press, 22 January 1963, p. 3. ‘Thawing in Their Own Drinking Club’, South London Press, 8 February 1963, p. 6. ‘West Indians’ Drink Club Defies Order to Close’, South London Press, 30 December 1959, p. 3. ‘Four Coloured Clubs Refused Drinks’, South London Press, 2 October 1962, p. 3. ‘Mango Club Fights to Stay Put’, South London Press, 1 August 1958, p. 1. Colin McGlashan, ‘Reggae, Reggae, Reggae’, Sunday Times Magazine, 4 February 1973, p. 14. Eric McAlpine, ‘What’s Wrong with Brixton?’, Flamingo, February 1964, pp. 13-15. Africanus, ‘Alabama in London’, Flamingo, October 1964, p. 56. ‘Hooligans Attack Coloured Folk’s Club’, South London Press, 24 November 1959, p. 1; ‘West Indian Club Blaze’, South London Press, 11 September 1959, p. 13; ‘Yard Probe Fire at Coloured Club’, South London Press, 20 September 1963, p. 1. ‘The Last Coloured Club in Brixton Closes’, South London Press, 29 November 1963, p. 1. ‘Residents Petition Against W. Indian Club’, South London Press, 2 December 1960, p. 1. ‘Well Run Club Refused Permission to be Registered’, South London Press, 29 June 1962, p. 4. ‘A Coloured Club Must Close in Brixton’, South London Press, 7 April 1961, p. 1. See, for example, ‘Somerleyton Road Begins to Wake Up Around 2 a.m.’, South London Press, 15 August 1961, p. 4. See ‘Comment: Brixton and Decency’, West Indian Gazette, June 1961, p. 1. ‘“Vice Den” Clean-Up: Minister Backs Council’s Drive Against Drink Clubs’, Brixton Advertiser, 12 May 1961, p. 1. ‘Police Declare War on Brixton’s Drink Clubs’, South London Press, 26 September 1961, p. 1. V. A. Sarl, ‘The Dark Strangers—By One of Them’, Brixton Advertiser, 1 March 1962, p. 3.